(Nanowerk News) Tuning the para position of benzene moieties is significant for creating biologically active compounds and optoelectronic materials. Yet, attaching a functional handle specifically at the para position of benzene has been challenging due to multiple reactive sites on the ring. 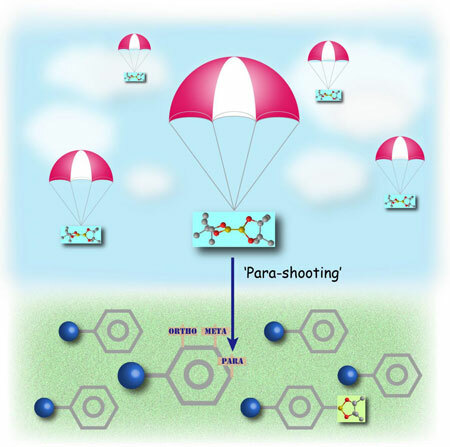 Chemists at ITbM, Nagoya University have developed a novel iridium catalyst that enables highly para-selective borylation on benzene, leading to the rapid synthesis of drug derivatives for treating Parkinson's disease. Nagoya, Japan - Yutaro Saito, Yasutomo Segawa and Professor Kenichiro Itami at the Institute of Transformative Bio-Molecules (ITbM), Nagoya University and the JST-ERATO Itami Molecular Nanocarbon Project have developed a bulky iridium catalyst that selectively directs a boron moiety to the opposite side of mono-substituted benzene derivatives. The opposite side of the benzene ring, known as the para position is important for tuning the electronic and steric properties of various organic molecules, including biologically active compounds such as pharmaceuticals and agrochemicals, as well as optoelectronic materials. Nonetheless, few reports have existed in obtaining para-selective benzene derivatives directly from mono-substituted benzene rings. Using a bulky phosphorus ligand, Itami and his coworkers have generated a new catalyst that uses steric interactions with the benzene substituent, to achieve the first highly para-selective C-H borylation, i.e. replacement of a hydrogen atom at the para position with a boryl moiety. The boryl group can easily be converted into other functional groups, making it possible to conduct late stage diversification of core structures containing benzene. The study, published online on April 10, 2015 in the Journal of the American Chemical Society ("para-C–H Borylation of Benzene Derivatives by a Bulky Iridium Catalyst"), displays the development of a powerful synthetic method that enables rapid access to para-functionalized benzene derivatives to construct libraries of bioactive compounds that are useful in medicinal chemistry. The applicability of this method was demonstrated by the efficient generation of para-functionalized derivatives of caramiphen, which is an anticholinergic drug used in the treatment of Parkinson's disease. Metal-catalyzed C-H borylation of aromatic rings is considered an efficient way to introduce functional groups to make functional molecules via a boryl moiety. Nonetheless, introducing a boryl group at a specific position on the 6-membered benzene ring has been rather challenging due to the presence of several reactive sites. The positions right next to the substituent on the benzene i.e. the ortho- (2- or 6-) positions are usually blocked by the substituent during C-H borylation. However, a mixture of meta- (3- or 5-) products and para- (4-) products are usually observed in a 2:1 ratio upon C-H borylation of a monosubstituted benzene. In addition, these products are usually difficult to separate from each other, thus, making it necessary to develop a highly para-selective reaction. "As altering the para position has been a common approach in biology and materials science for creating benzene-containing functional molecules, I figured that para-selective C-H functionalization would be an extremely useful technique for the late-stage diversification of core structures. However, there has been no general way to do this up to now," says Kenichiro Itami, the Director of the Institute of Transformative Bio-Molecules. "Since starting this research in 2009, we have been trying to find ways to introduce functional groups at the para position of the benzene ring" says Yasutomo Segawa, a co-author of this work. "Yutaro picked up this work in 2012, and screened over 200 ligands to find the right conditions to achieve C-H borylation in high para-selectivity." "I looked at all the ligands that I could find in the labs and after a year and a half of screening, I finally found that BINAP, a phosphorus-based ligand, along with an iridium catalyst showed relatively high selectivity in introducing a boryl group (Bpin), at the para position," says Yutaro Saito, a graduate student who conducted the experiments. "Nitrogen-based ligands are usually used in C-H aromatic borylation reactions, so everyone was surprised to see that phosphorus ligands were applicable," he continues. "I was really excited upon seeing the increase in para-selectivity and yield as I was screening the phosphorus ligands." Through screening of various phosphorus bridged ligands, a bulky diphosphine ligand, Xyl-MeO-BIPHEP was found to be effective in blocking the meta position of benzene rings bearing a bulky substituent, to achieve as much as 91% para-selectivity for C-H borylation. "This is a great improvement from the 2:1 meta:para selectivity that we were initially observing," says Segawa. "We also found that if the ligand is too bulky, the reactivity and selectivity for the reaction decreases, so there is a balance in the reaction with the size of the ligand," says Saito. The reaction conditions developed for this C-H aromatic borylation were also compatible with various functional groups, such as esters, alcohols and ethers, making this reaction potentially applicable during the late stage synthesis of benzene derivatives. Caramiphen, an anticholinergic agent used for the treatment of Parkinson's disease contains a monosubstituted benzene moiety along with ester and amine groups. There have been reports that the activity and selectivity of caramiphen could be improved by functionalization at the para position of the benzene ring. Thus, the iridium catalyst Ir[Xyl-MeO-BIPHEP] was used for the para-selective C-H borylation of caramiphen, to generate the desired para-borylated product in 83% para-selectivity and 61% isolated yield, in the presence of reactive groups. The borylated compound was used as a common intermediate to obtain both known active and novel derivatized compounds of caramiphen. "Although we still need to work on improving the selectivity and the range of substrates that we can use for this para-selective C-H borylation reaction, we were able to demonstrate an example of a sterically controlled catalytic reaction," says Saito. Segawa and Itami say, "We hope that this reaction would be applicable for making useful para-intermediates that would lead to the rapid discovery and optimization of lead compounds in the pharmaceutical, agrochemical and materials industry."